Pennsylvania-based R.E. Gas Development LLC and its affiliates are independent publicly-traded ($REXX) oil and gas companies operating in the Appalachian Basin with a focus on drilling and exploration activity in the Marcellus Shale, Utica Shale and Upper Devonian Shale, mostly throughout Western Pennsylvania. Like most other exploration and production companies that have found their way in bankruptcy court over the last several years, the sudden steep decline in crude oil and nat gas prices that began in 2014 significantly affected the company's liquidity and ability to manage its balance sheet. After all, this company isn't operating in the Permian. Revenues for 2017 were $205.3 million. After months and months of foreplay, the company enters bankruptcy court with a restructuring support agreement ("RSA") in tow: it provides for a dual path pursuant to which the company will, in agreement with its secured lenders, pursue a sale of substantially all assets or, in the absence of qualified bids, pursue a plan process pursuant to which the first lien lenders (i.e., Angelo Gordon) will swap (DIP) debt for equity in the reorganized company. 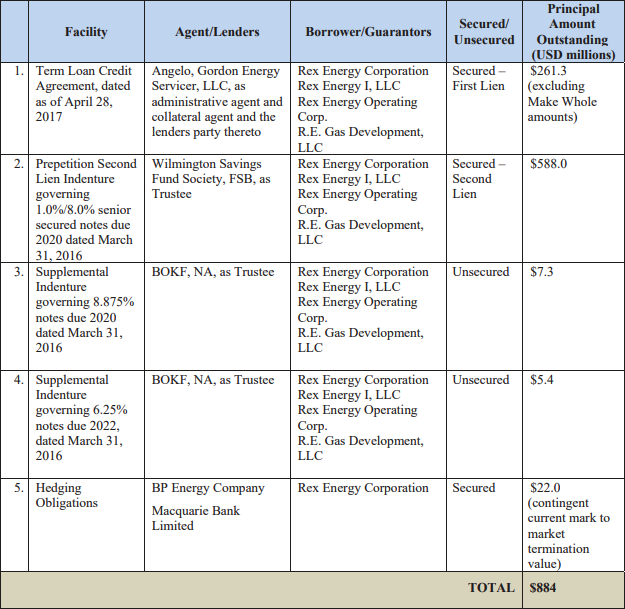 The RSA purportedly has the support of 100% of the first lien lenders and 71.8% of the outstanding second lien notes. To fund the company throughout the dual process, the company seeks a $411 million DIP credit facility, the proceeds of which will be used to (i) roll up $261 million of prepetition loans and (ii) settle the "makewhole provision" under the first lien credit agreement to the tune of $50 million. The makewhole was put into place at the time of the issuance of the first lien loan just short of a year ago. For the uninitiated, the makewhole entitles the lender to certain economics in the event the lenders are "repaid in whole or in part prior to the maturity date or the outstanding indebtedness under the facility is accelerated for any reason." The economics are calculated "based on the sum of remaining interest payments and certain fees due on all loans for the remainder of the make whole period, which terminates on October 28, 2019." In other words, Angelo Gordon structured this to give themselves the utmost economics in the (highly likely) case of an event of default and eventual bankruptcy. Solid planning on their part -- assuming, in particular, that the assets fetch a purchase price that will clear the first lien debt and makewhole amount. Respect. So, lo and behold, there was an event of default called in February for failure to deliver quarterly financial statements (which led to other defaults as well). In April, the lenders, after a short forbearance period, issued a notice of acceleration. Cha ching! Makewhole!! The DIP credit agreement imposes fairly expedited -- but not wholly unreasonable (relative to other recent cases) -- timing on the company, including closing of any sale or confirmation of a plan 170 days after the filing date. Oil&Gas, WD of Pennsylvania, Judge Deller, Wilmington Savings Fund Society FSB, Jones Day, Buchanan Ingersoll, FTI Consulting, Perella Weinberg, Prime Clerk LLC, Angelo Gordon, Simpson Thacher, Akin Gump Strauss Hauer & Feld LLP, Reed Smith LLP, Morrison & Foerster LLP, BOKF NA, Arent Fox, Frederic Dorwart Lawyers PLLC, Conway MacKenzie Inc.
New Chapter 11 Filing - The Original Soupman Inc.
6/13/17 Recap: Bankruptcy for you! Company that licensed the name and recipes of the chef who inspired the "Soup Nazi" on Seinfeld has filed for bankruptcy with a $2mm DIP credit facility to fund the case. The CFO had been indicted for tax evasion. We wonder whether the prison he goes to will have soup that lives up to the Soupman standard. Anyway, we digress. The company sells soups to and through grocery chains (6500 of them) and club stores throughout the United States; it also provides soup to the New York City School System and has six franchised restaurants, the largest of which resides on the Upper West Side. So a Nazi serves the school system. Awesome. Jurisdiction: D. of Delaware (Silverstein). Capital Structure: $3.66mm secured debt (Hillair Capital Investments LP), $3.3mm unsecured notes. 12/15/16 Recap: New York based consumer products retailer of home furnishings (i.e., china, glassware, metalware, and all kinds of other things that millennials scoff at buying) files for bankruptcy to salvage what's left of its liquidating business after failing to renegotiate with its lender and landlords. This is its second bankruptcy filing in 6 years.